Don Demers Hand signed and Numbered Limited Edition Giclee on Canvas:"Violet"
Edition: Limited to 50 w/ COA. About The Artist: Donald Demers was born in 1956 in the small rural community of Lunenburg, Massachusetts. His interest in painting maritime subjects began while spending his summers on the coast of Maine near Boothbay Harbor. Crewing aboard schooners, square-riggers and other traditional craft have provided both the foundation for his technical expertise and the vision to transfer his first- hand experience to the canvas. His love of sailing has not diminished over the years. Don acknowledges his high school art teacher as the most formative influence in his early training. He continued his education at the School of the Worcester (MA) Art Museum and Massachusetts College of Art in Boston. 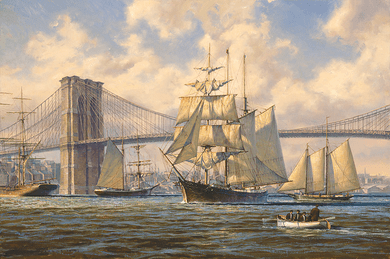 His professional career began as an illustrator and soon expanded into the field of marine painting. A move to Maine in 1984 marked a shift in his career in which illustration yielded to marine and landscape painting. Illustration serves as a diversion from the demands of fine art and over the years, Reader's Digest, Sail Magazine, Field & Stream, Sports Afield, Yankee, Downeast and most recently, the prestigious National Geographic magazines, in addition to several book publishers, have called on Don to create visual illumination for the written word. Don's diversity has enabled him to offer his expertise to clients ranging from American Airlines to the National Park Service, with projects as varied as creating art for national television advertisements and designing art glass for Steuben. Demers' body of work has expanded over the last several years to include the study and creation of both plein air and studio landscape paintings based on 19th century methods and philosophies. His landscape paintings have been widely acclaimed and honored throughout the country. Created in consort with painters of similar inspiration, it has been widely acclaimed and honored throughout the country. He is a Fellow of the American Society of Marine Artists, won a record number (11) awards at the Mystic International Marine Exhibition, Mystic, CT and at the Laguna Plein Air Invitational, Don has won two awards. His illustrations have been recognized four times by the Museum of American Illustration in their national competition as representing the finest examples of work in the field. A master of communication about his art form, Mr. Demers conducts workshops for artists and lectures on his art and maritime experiences, both here and abroad. Don has been featured in American Artist magazine, Artist magazine and Plein Air Magazine. His audiences include museums, art clubs and associations, yacht clubs, historical societies and educational institutions.